On a cold November day in 2005, I headed downtown with the hope of landing the signature of a legend for my new guitar project. I’m a collector of music merchandise and memorabilia. Some people collect to sell. I collect to preserve moments in time that mean something to me. Every poster, photo, stray drum stick, concert tee, backstage pass — all of it kind of feels like being surrounded by old friends with great stories to tell. The guitar project began as a way to collect as many signatures as I could on an acoustic from the greats who inspire not only me, but legions of people with their talent and love for music. I had already made some headway, having been lucky enough to meet and get Joe Perry of Aerosmith to sign. But 10 years ago I was younger and less experienced in the ways of the world, and the idea of actually meeting someone like B.B. 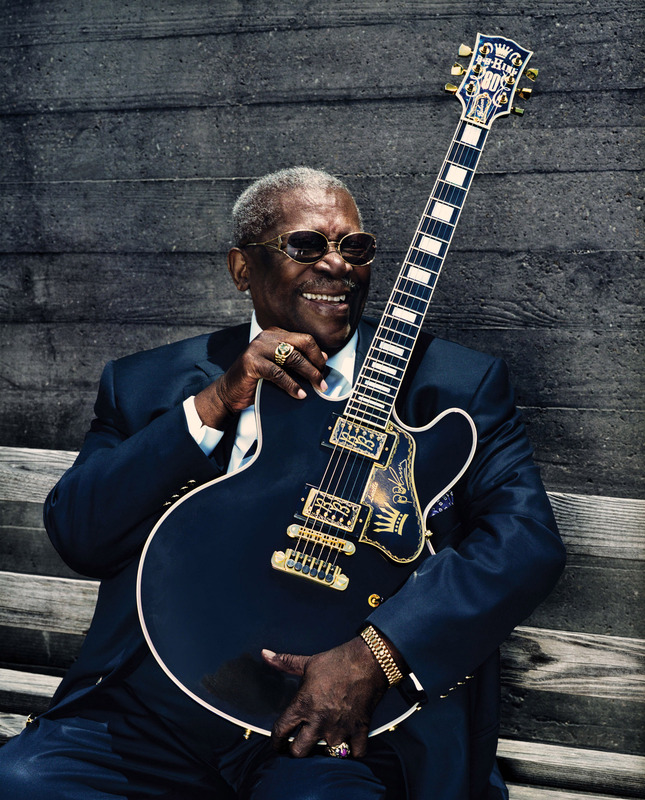 King — the “Ambassador of the Blues,” a world icon, and the guitarist to which legends like Perry, Eric Clapton, Buddy Guy, Stevie Ray Vaughan, Carlos Santana, Jeff Beck, Keith Richards, Jimmy Page, and countless other players took their cue — seemed a long shot. Yeah, I was nervous. Crazy nervous. I tried to be professional and go through the proper channels, starting with King’s manager at the time, Tina France. Let’s just say that she was less than helpful and I knew I had my work cut out for me. 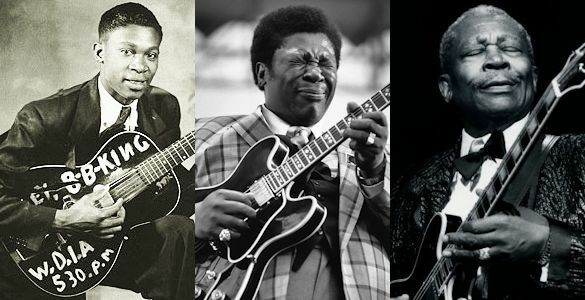 I was also trying to find my way to Robert Cray, and upon talking to someone at The Rosebud Agency, by chance, discovered that King would not, or rarely, sign any guitar that wasn’t a Gibson. So I did the only thing I could think of: I went to Home Depot and picked out a few brochures on different types of wood for flooring and porches and began slicing them up until I had enough to make a symmetrical headstock cover. I took a Sharpie, drew a Gibson logo on top and put the tuning pegs back in place. I made no further advancements through email or phone. I would be going down there with nothing but my wit, will, and a guitar with a hack headstock in hopes that nobody got wise. I know what you’re thinking. It’s okay. At 20, sometimes the only road that makes sense is the long one. The day of the show I packed up and went over the plans in my head. My parents were watching Calendar Girls in the living room. When I heard King’s unmistakable voice in the film, singing “You Upset Me Baby,” I took it as a sign. Standing outside the Lowell MemorialAuditorium wasn’t the most fun I’ve ever had. It was freezing and waiting outside for King, I felt like I was trying to land a 900-pound tuna with a twig. The day turned into night. The back entrance to the auditorium was desolate for many hours without a soul passing by. Nothing but a bus, which I knew had to be King’s. Several hours later, a well-dressed man and woman came walking up the entrance: Jacques Raymond and Sunny Crownover, who were opening for King. We spoke for a few minutes and I shared my story. They must’ve felt bad I was waiting out there that whole time because Jacques brought me inside. They tried to get me in as part of their entourage but it wasn’t meant to be. We parted ways and I ended up back outside. I spent six hours outside before there was any movement. All of a sudden, members of King’s band started shuffling around. I knew the moment was coming soon, but before King was ready to be taken off the bus, his personal assistant, Norman Matthews, had come out to confront me as I was the only one in the way of King and the stage. “Yes,” was all I could manage to reply. “I’ll sign it after the show,” was all he said as he was quickly ushered inside. With all its history, The Lowell Memorial Auditorium felt like the perfect place to see someone like B.B. King for the first time. The intimate room has great acoustics, and I watched in awe from the front of the balcony as he wooed the crowd with song and story. With his famous guitar, Lucille, in hand, he threw out pins, pics, and even signed a few signatures from the stage. One of the last of theold guard, King infused elements of jazz into blues and made a clean cut and polished image for himself. 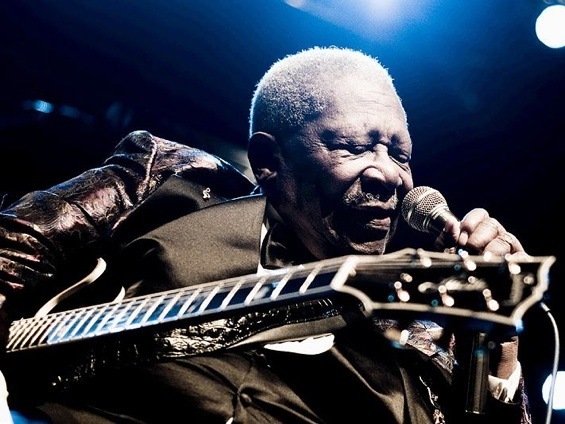 Unlike most bluesmen who made their fame in Chicago, B.B. cut his teeth in Memphis before the days of Elvis, Johnny Cash, and Jerry Lee Lewis, landing a radio station spot at WDIA after coming up with a jingle for a drug tonic named Pepticon. From the cotton fields of Mississippi to the world as his stage, Riley B. King was a person of epic proportions in every way possible. He had style and class, and was always generous to his peers and fans. When the show was over, I quickly ran to get my guitar and attempted to find my way back to where King was. As I made my way around the auditorium, I saw a curtain and some people standing in line. I could only assume these people were waiting in line to meet King. Everyone made small talk while waiting. In front of me was drummer Daniel Banks and his father Douglas. Danny had been about 11 at the time, by far the youngest there, and a drum prodigy. Having been on The Late Show with David Letterman, some of the people in line already knew him. 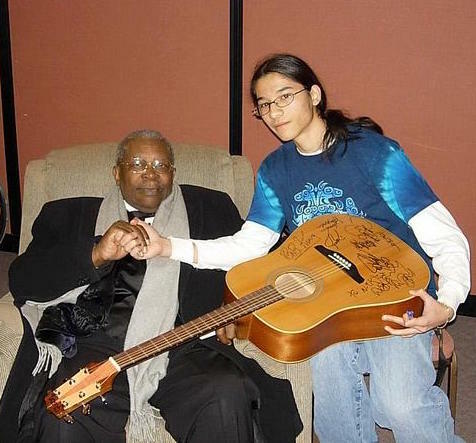 When we finally made it up to The King of the Blues, he spent a lot of time encouraging Daniel to do well in school and to keep perfecting and honing his talent. Hearing King give him this kind of advice was not only inspiring, it was like listening to Morgan Freeman narrating your life. I got a few minutes with King next, and told him that the show was great and that I had brought my guitar for him to sign. He told me that he said he’d sign it earlier and that he’d do it now. I’m not sure if he noticed the headstock or not, but he took the pen I had and signed a beautiful full signature that took up a large portion on the right side of the guitar. Douglas was kind enough to take a photo of us together and I said goodbye. Nick Tsui meets The Ambassador of Blues. As I was exiting the auditorium I ran into his assistant, Norman, once again. He looked at me and asked if B.B. signed the guitar. I told him that he did. He pondered for a minute, then let out a cackling laugh. “You did really well. I’m really happy that you got what you wanted.” He then shook my hand, handed me a guitar pick and a lapel pin and walked away; it wasn’t one of the cheap plastic ones that King threw out into the audiences by the handfuls every night, but one of the metal ones he would wear on his tuxedo during shows. I honestly couldn’t even tell you when I first heard or knew of B.B. King. For me, he’s been ever present. He died in Las Vegas on May 14, 2015, at the age of 89. It’s safe to say that King lived his life to the fullest, giving more to the world than he ever knew. B.B. had been on tour since the 1950s. The road was his home. The music, his soul. The fans, his heart. The man may no longer be a presence on a stage. But his songs and stories will live on forever.